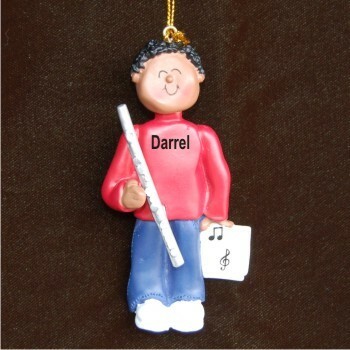 No matter what music style they prefer, flutists all love the flute virtuoso African American male personalized Christmas ornament that also comes in Caucasian and female versions. These attractive musical instruments ornaments personalized with the name and year include our gold cord for display them just about anywhere including a music stand or flute case. Surprise your favorite flutist with the African American male flute player personalized Christmas ornament that arrives in our plush velvet gift pouch. For tutor Dec 17, 2014 Jasmine J.